Before I get all cranky, let me get the update out first. I have started shipping, so if you are in any of these zip codes: 68702, 60060, 49001, 17402, 85255, 91320, 46561, 63303 or 12967, you should be getting something this week. I hope to make another group of shipments tomorrow (maybe). So there. Ok - I purchased some 2014 flagship so I can rightfully bash the product. I figure if you buy it, you can complain about it. So let's talk about all I think is wrong with the release, plus the one thing I think they got right. Yup - I said "right". You give props when it's earned. Plenty have said that the 2014 design looks like Bowman. I'll agree with that statement. However, when you combine really poor cropping with a design that is misweighted, it's a disaster. 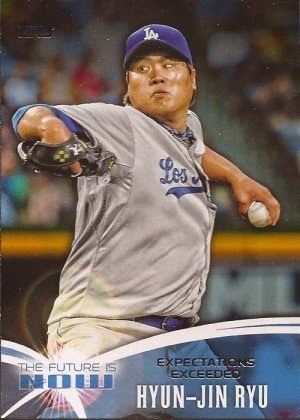 For some reason, Topps used a zoom lens on most of the pictures. And then, with whomever is in the room laying out the cards, the drive was to have the player's face centered left/right on a great majority of the cards. 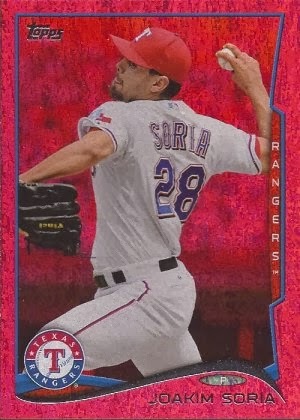 In that, you can see in the scanned cards above how that places the images of the players incorrectly within the frame. 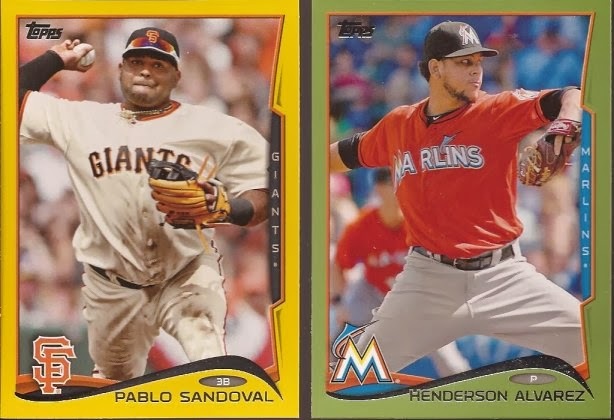 The Ramirez and the Melky are both too far right, and with the stupid team name side box, the cards are really heavy to the right. The Guthrie has the same poor framing, however this card is less of an issue with the bleed out of frame to the left. The name sort of balances the image, but in actuality, it doesn't in my opinion. 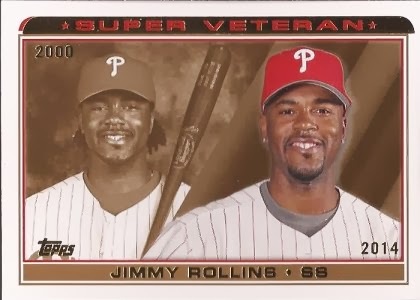 Most of the horizontal cards work well within the frame, but that team name is a real bother. What - blue and red were not enough, along with the black, cammo, platinum, silver, blah, blah, blah...? This is a money grab for those that like to build rainbows. Also - yellow and green? Why not a couple worse colors like burnt umber and smurple? Silver worked. Gold worked. Green worked. Red does not. I'll talk about a couple of the inserts. This one is famous for the really pathetic pithy sayings above the player's name. If you are unsure, just read this. Horrible layout. A ton of wasted space. It's like they came up with this card in five minutes. Upper Deck called. They thank you for stealing one of their really bad designs. 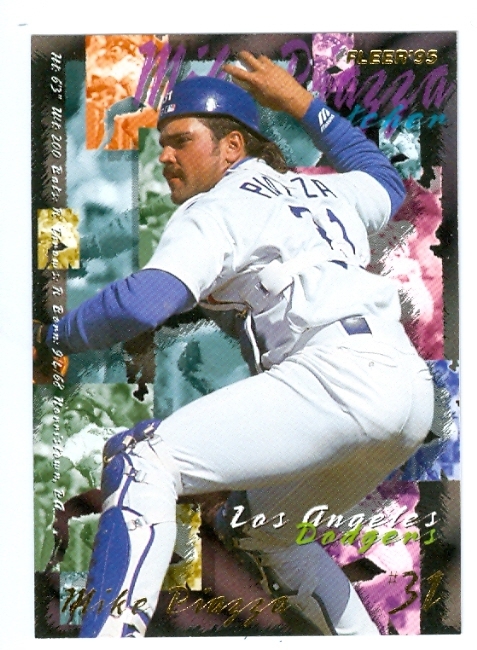 Here's hoping 2015 Topps borrows from '95 Fleer. So what, in my opinion, works? Probably the one thing most people dislike. When I saw the images, I thought these die cut minis would be dreadful. 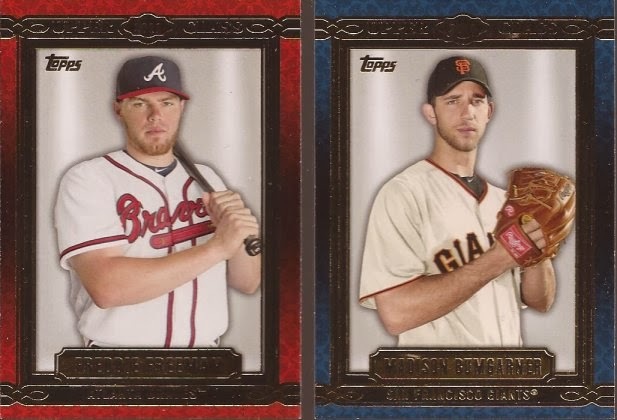 However, getting one in my hand (even if it's Donnie Baseball), these are really neat. 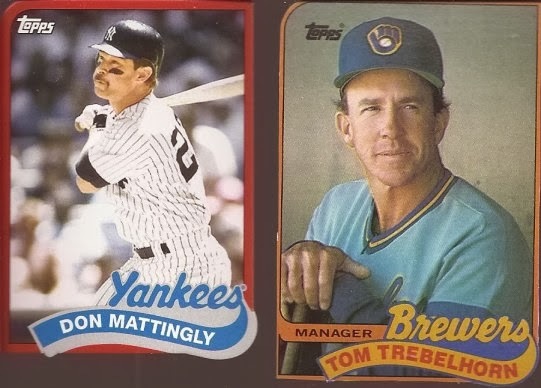 It's a far better way to showcase probably the most over printed set ever by Topps than putting it in Archives or another product. Let's play arts and crafts here at 2x3 world. 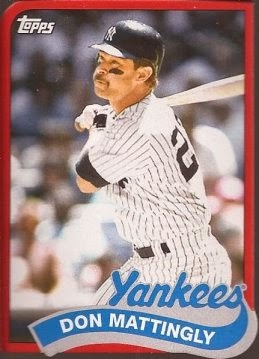 The edge is a lot wider than the original '89's, plus a change in the logo and the window of the image below the ribbon, but otherwise it's a fun way to use that design as a mini with the shaping of the card. That being said, I'm still only collecting the old timers and White Sox minis. So there's my final opinion on 2014. A big miss in my book. Feel free to have your own comments on my thoughts, but in the end I'm right, cuz it's my blog and what I say goes! Well, on the good side, I can't wait to cut up my 1989 Topps. 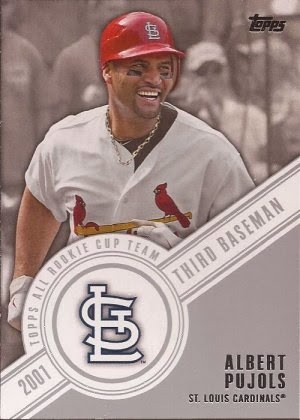 I think I just had an anurism looking at that 95 fleer. I'd collect smurple in a heartbeat!! What a steaming pile of excrement those inserts are. I mean wow.